David Simpson and Carla Lockhart DUP at Baird's Factory. A meeting was held for residents on Friday to discuss the ongoing problems with anti-social behaviour at the site of the old Bairds Factory. 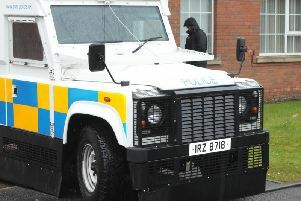 The meeting, which took place at The Willows, was hosted by DUP Councillor Carla Lockhart and attended by the PSNI and local residents. It followed several nights of trouble at the site, with emergency services having to attend the scene. Residents of The Willows, in the Mourneview area, have frequently been subjected to anti-social behaviour at the former factory site in recent years. Councillor Carla Lockhart commented: “This site has been problematic for over two years. It is a Mecca for unsavoury behaviour. I have - on three occasions - been able to have the site secured, however it is proving more and more difficult to have it secured in a way that actually keeps groups out. This site is dangerous for any young person to be in, and I would encourage parents to help deter young people from entering in case they get hurt. Councillor Lockhart appealed to residents to alert the PSNI immediately if they observe any suspicious activity at the site. Constable Michael Allen said: “We were aware of some antisocial activity in the area, however the extent of the problem revealed at the meeting on Friday is not reflective of the number of reports we are receiving. I explained to those attending the meeting that it is difficult for us to target our resources and get a sense of the full extent of the problem if we are not made aware of what is going on.